New stock files for Tower Systems POS software users | A blog about smart POS software for independent small businesses. When we advertise a new role on Seek as we have done this week and the ad notes No Agents, we actually mean that. We have never used a recruitment agency and it is unlikely we ever will. The Point of Sale software offered by Tower Systems offers retailers the ability to sell products at priced set by the volume of an item purchased. The flexibility in pricing allows retailers to be flexible on the shop floor in a structured way than can guide volume purchases. This is especially useful in garden, homewares and gift retailing – three areas where Tower Systems shines with retail channel specialist software. This is another way Tower helps retailers grow their businesses. The latest public rankings and kudos from the XchangeIT newsagent EDI platform honours five Tower newsagents in their top ten. Newsagents using software from two other companies are in the remaining five out of the top ten. While not a massive deal, it’s good to see recognition for good operation of our newsagency software. Tower Systems has started contacting customers to invite them to be part of a trial group to play with something completely different. In return for confidentiality, early adoption and detailed feedback, participating retailers will be given free access to software that breaks with tradition. Two years in the making, this project is another example of Tower Systems investing in software for small businesses. Leadership in action will be clear when the software steps into the public eye, soon. 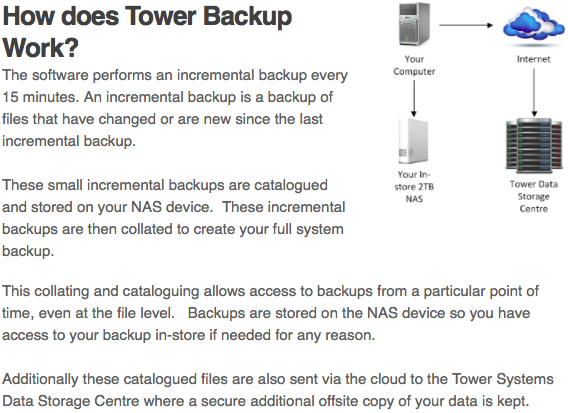 While Tower Systems has supported external and automated backup services for years, this week the company launched a new even more hands-off cloud-based backup service that offers excellent protection to participating small retail businesses users our our POS software. The new approach represents better protection for our small business retail customers. It is available for commercial implementation following comprehensive live testing. Tower systems has been using the new facilities in beta for two months. This week’s announcement moves the opportunity to full commercial release. The 2015 edition of our POS software for retailers includes enhanced Xero integration facilities. In the enhancements we deliver the next generation of changes to enable retailers to get further benefits from linking their POS software with Xero. More data is transferred making the Xero reports more comprehensive while at the same time saving bookkeepers and accountants more time and more fees. The latest enhancements have been developed with CPA, user and Xero input. The result is a terrific benefit for the Tower user community that keeps us at the forefront of Xero integration. Our in-house studio has been busy this week with new training videos being shot to accompany our 2015 edition POS software. The training videos are necessary to ensure that our online and digital training resources are useful for the current release of the software. Fifteen new videos are being filmed and produced. With more than one hundreds training videos in our library, Tower Systems has a comprehensive suite of training that is best practice in each marketplace in which the company operates. The release of the Tower Systems POS software that has commenced rolling out is the 2015 edition, a version of software packaged with enhancements ready to deliver to retailers tools they will want to leverage in 2015 in a more competitive and cost conscious environment. Representing man-years of development effort, the 2015 edition of the Tower software has hundreds of benefits for retailers who engage. The suite of enhancements represents Tower Systems listening to its customers and leading by example. Packed into the 2015 edition of the software are facilities that help save time, guide better business decisions and position the business more effectively for competition. The 2015 edition presents many new opportunities for 2015. Offering Lay-by services is essential if you want to grow sales of collectibles and higher priced items. It provides shoppers an opportunity to purchase today what they are unable to fully pay for today. Essential to your success with Lay-bys is having a streamlined and consistent process for processing Lay-bys, storying lay-by product, collecting payment and tracking customers. Once mistake with managing Lay-bys can be expensive. Use software to track Lay-bys. Do not do it manually. Use the software to capture the sale, record customer details, document your terms and conditions, record the deposit, track payments, chase late payments and finalise the sale. Again, to not attempt to do this manually. Be complete in what you record. 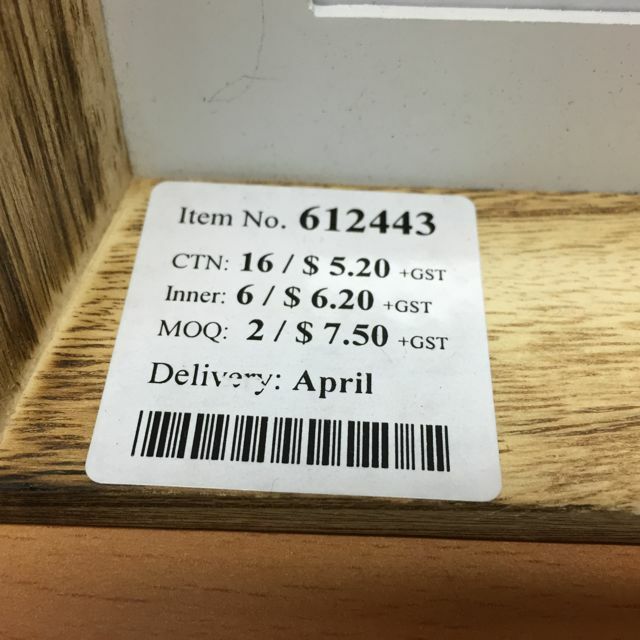 Only Lay-by stock for which you have records in your software, always enter full customer details such a full name, complete address and an ID number such as a driver’s licence number. If you are not complete in your records keeping at some point this will cost you money. In your software set your deposit requirements, payment requirements and other Lay-by terms. This provides a foundation of consistency for you and your employees. 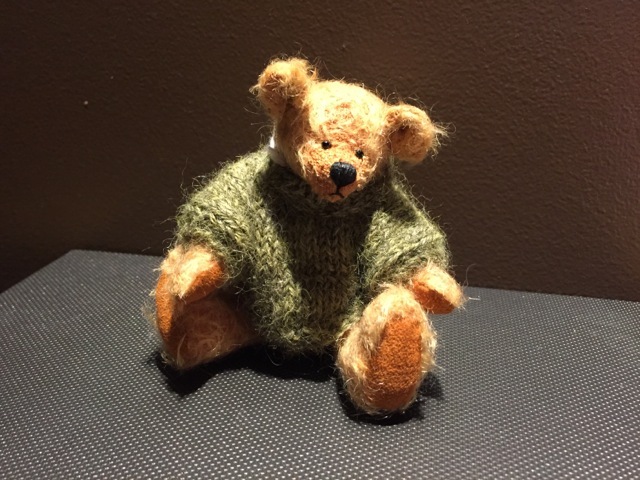 Before you begin with Lay-bys check the website of your state Consumer Affairs office to familiarise yourself with local requirements. Information there will help you determine your own terms and conditions. 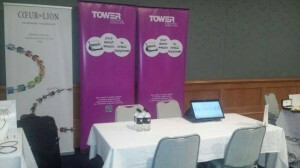 Tower Systems has won more newsagency software business this week on the back of a total cost of ownership comparison. By demonstrating that it is more cost-effective to install our best-practice industry standard software than to keep using existing, and what we’d consider lesser, software, newsagents change. Newsagents and other retailers need to consider the total cost of ownership of software – that is, the support fees and other fees that are necessary to keep newsagency software working. As happened this week, Tower Systems delivers what newsagents want. Today was a great day at the office at Tower Systems and while not dramatically different to any other day or Friday, it was great. It was one of those ten steps forward days we got a lot done on a range of fronts in terms of short and medium term future planning. It was also a day when we saw several previously separate projects come together. Plus we got to meet with a couple of suppliers on initiatives that will add value to the relationships we have with our customers. Today we also received some terrific feedback from customers of business success they are having as a result of using our software. That’s a thrill for us. It’s the why we do what we do that matters most to us and days when we can see the why are terrific days. Today was one of those days. It was a great day at the office. The recent Pet Expo in Sydney provided an excellent opportunity for pet retailers to compare three pet shop software products and the companies behind them. With the three stand relatively close to each other and the trade shop not as busy as some, comparison was easy and this is what many pet shops did – comparing software functionality, ease of use and the support services offered. Tower Systems did well in the comparisons based on the business resulting from the trade show experience. We are grateful for opportunities such as the Pet Expo that facilitate head to hear comparison between software companies. POS software company Tower Systems encourages user feedback in its extensive online customer support inventory of videos and advice sheets by encouraging open and public comments and inviting likes to indicate usefulness.This is another example of how Tower goes above and beyond in pursuit of excellent customer service. With electronic invoices already available for Tower Systems Pet Shop Software users from Masterpet, Kongs, Pet Pacific, Dr Neil’s and Pet Premier and more coming on bard, Tower Systems is helping more pet products retailers to save time in their businesses. This is not just a one-way flow of data. Thanks to sales data and other initiatives within the Tower software, retailers and suppliers are able to work more closely together to facilitate a more valuable relationship. we work actively with large and small suppliers. Tower Systems has a full time staff member responsible for managing supplier relationships, to make the most of opportunities for our customers and their suppliers. 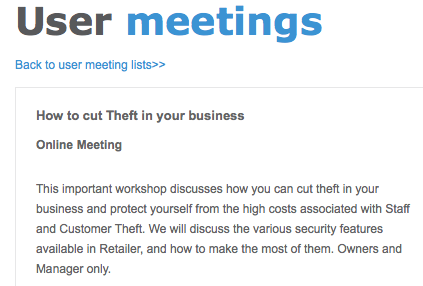 Tower Systems is hosting an online workshop at 2pm (AEST) today for retail business owners on How to dust theft in your retail business. This online live workshop is another in the weekly series by the company for retailers using its POS software. It’s a great learning opportunity that will benefit any retail business owner. Plus it’s FREE. 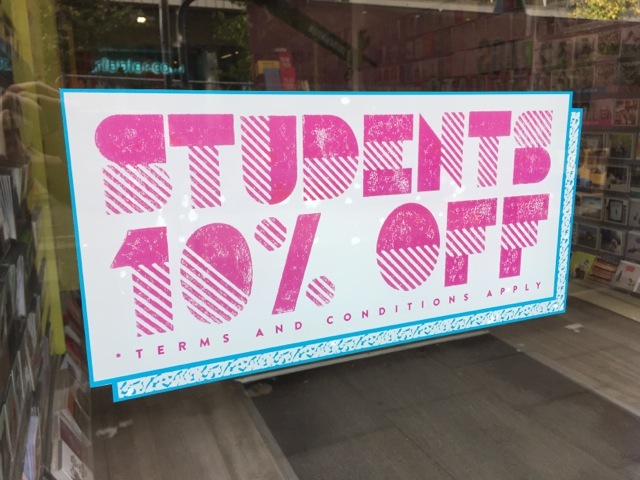 Thanks to flexible discounting options within our POS software, Tower Systems helps retailers to offer discounts that matter at different times of the year – like Student Discounts at back to school and back to uni time. With appropriate rules used in the software, retailers are able to track discounts driven for their own interest or for supplier rebate purposes – and for the benefit of local schools that partner with the retail business to help drive traffic to the store. Providing retail employees with certainty through which they are able to transact business and handle opportunities such as student discounts is a valuable feature of the Tower software. It helps small and independent retailers to offer benefits you;d typically see in bigger businesses. Retailers using the Tower Systems Point of Sale software can relax and enjoy Saturday knowing we have their back. Our help desk is open and taking calls this morning – in addition to our after hours mobile numbers. We have offered a help desk based Saturday service for many years. Our customers appreciate the extra commitment. It’s another Tower AdvantageTM. Retailers of collectibles have needs beyond the traditional for retailers using POS software. In addition to managing additional data points, they often prefer to document the transaction in a non-traditional way – i.e. not on the usual type of receipt roll. Tower Systems offers a range of solutions to high-end collectibles retailers, solutions that enable them to better serve their collectors and to manage the unique mix of suppliers from whom they pull the products they sell. For breakfast at our head office today we included some tasty Halloween themed treats. 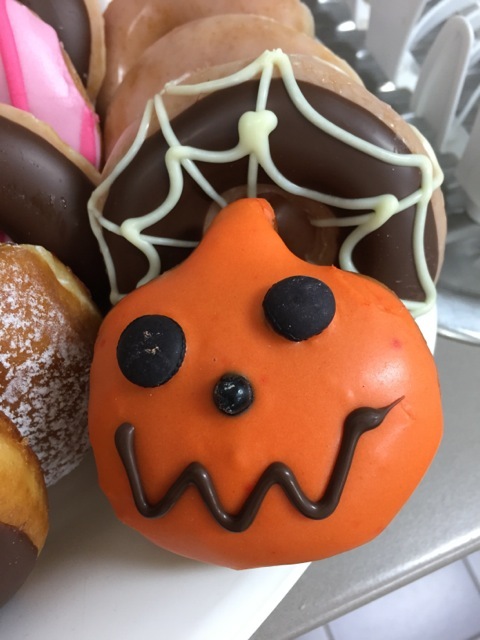 With hundreds of our customers using our POS software embracing Halloween in their retail businesses we figured the least we could do was to eat some scary donuts in support of them. Thanks to Krispy Kream Halloween is in the air at the office today. A key service in today’s bike retail business is the provision of maintenance and repairs services. Thanks to smart tools and flexibility built into our bike shop software, retailers partnering with Tower Systems are able to streamline the management of the maintenance side of the business. From tracking staff and services through to improving customer communication, the Tower bike shop software provides bike retailers with facilities to run a more efficient and valuable business. TheTower Systems specialist bike shop software also offers a points-based loyalty program as well as a more immediate loyalty option that will help your customers spend more each visit. Called discount vouchers – but you can call it whatever you prefer – this program offers shoppers cash they can spend immediately or within a time period you stipulate. You can compete with online with immediate rewards for those who shop with you. You can expect between 12% and 30% of vouchers to be redeemed and up to 30% of redemptions to be on the day of the initial purchase. We have excellent data we can share with you where this is being used today. QLD/NT: Paul Slater 0434 365 789. Tower Systems already helps hundreds of bike retailers. The Jewellers Association of Australia invited Tower Systems to participate in a trade day in Perth last week and we jumped at the opportunity. This low-key event provided us with an excellent opportunity to network with jewellers and talk business – specifically how our jeweller software helps jewellers to provide a level of personal service on which they can rely for a brighter future. We also showed off jeweller specific reporting facilities and explained how hundreds of jewellers in the Tower user community have access to these today. As the only jeweller software company participating we appreciated the support of the JAA in allowing us to better connect with jewellers in Western Australia. We are thrilled with the retailers joining our user community this year at Tower Systems. Some are installing POS software for the first time while most are switching from other software. It is our Discount Voucher facilities which wins many customers for us. Beyond the vouchers, in the software, we have real power at the fingertips of retailers and their staff. We back this power and flexibility with terrific reports that make using the software valuable for the business. Enabling retailers to track voucher flow is proving to be tremendously valuable in guiding retailer engagement o tweak their use to drive even better outcomes. Our Discount Voucher facilities are an excellent demonstration of the Tower Advantage in action. We are grateful to our customers for excellent feedback that is guiding further developments. Garden centres using any of the four loyalty tools in the Tower Systems Garden Centre software this Spring can leverage the tools to help bring Spring customers back this season or in Summer. Offering tremendous flexibility, the Tower Garden Centre Software helps independent garden centres to offer more valuable and flexible loyalty options that are tuned to serve the needs of the local business as it differentiates itself from major retailers in the same garden space. Tower Systems understand that it is not about loyalty points. This is why the company offers four different loyalty options and serves each with flexibility to help the retailers tune the offer in a way that reflects their local offer and pitch. Tower Systems helps garden centres make the most of the facilities with personalised training and one on one support. We are thrilled with the reports of success we are receiving from garden centres.